With Italian Clemente Russo taking Azerbaijan's Teymur Mammadov out of the competition earlier today, Super Heavyweight Magomedrasul Medzhidov got one back for the Azeri with a win over Italy's Roberto Cammarelle. This was not only revenge for the team, but also a levelling of old scores on a personal level. This evening we had the Flyweights (52kg), the Lightweights (60kg), the Welterweights (69kg), Light Heavyweights (81kg) and the Super Heavyweights (91+kg) battling it out for a place in the finals. 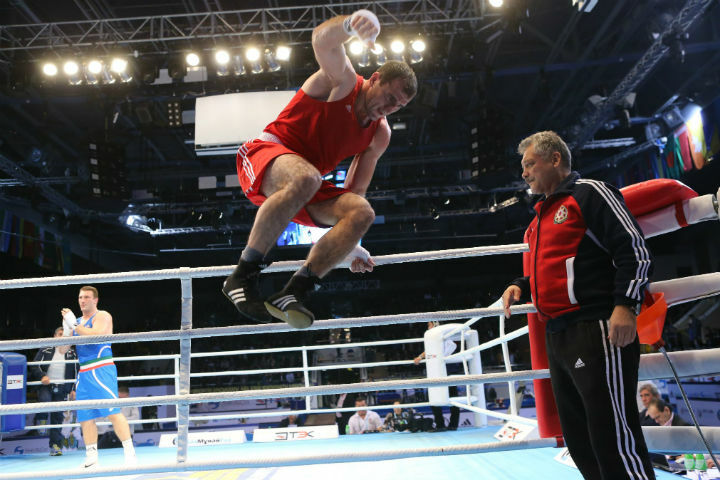 Super Heavyweight Magomedrasul Medzhidov of Azerbaijan took out veteran Roberto Cammarelle in a stunning performance. This bout was a repeat of London 2012 Olympic Games semi-final, but this time we saw the opposite result as the Azeri pulled one back against the Italians for the whole Azerbaijan team. Medzhidov floored the Italian in the first round, just two minutes into the round giving the stunned looking Italian a standing eight count. Thereafter (and at long last), the Italian's hands finally went up to cover his head. But the bad habits resurfaced in the second when during an exchange he dropped his right hand and got nailed again with a blow that wobbled him. As he bounced out of range from that same exchange, his hands were low again and he got clipped by a supplementary jab on his departure. Cammarelle then had a late resurgence in the dying seconds of the round and unleashed a good combination and then ducked under what would have been a hard hook to finish round two on a positive note. Now clearly behind, the Italian needed something special to get the bout back on course. Luck was on his side when the APB and WSB Azeri was deducted a point for leading with his head at the beginning of round three. That brought the bout closer, but it was still not enough for Cammarelle, and Medzhidov took the bout. The Italian was given wide applause around the arena, as the Kazakh fans recognised him for the legend that he is. Therefore we will be seeing the hard hitting Medzhidov in the final tomorrow against local favourite Ivan Dychko. Chatchai Butdee, who has been impressive in this tournament, squared off against APB Boxer Misha Aloian of Russia at Flyweight. The two southpaws both looked good with the Russian working his lead hooks and the Thai looking for linear shots straight down the middle. It was the Russian who landed the better strikes however and in truth it wasn't until the final round that the Thai athlete landed anything substantial. The Russian supporters began chanting in the final round and it was indeed the APB man who took the win 3:0. He will now progress to the finals tomorrow to face Jasurbek Latipov of Uzbekistan after he defeated Welshman Andrew Selby in an extraordinarily close bout. Cuba Domadores Welterweight Arisnoidys Despaigne, who is scheduled to make his WSB debut next season, took on Gabriel Maestre of Venezuela. Maestrestarted round one with a high guard, whilst the Cuban danced around with his hands low. This was the complete opposite of the other Welterweight bout between Daniyar Yeleussinov of Kazakhstan and Arajik Marutjan of Germany, which was like watching a tornado having a fight with a typhoon. Instead, this bout was more of an advanced game of tag, with highly technical exchanges and significant tactical work going on from both boxers. The Venezuelan seemed to be cautious in opening up and visibly fatigued towards the end of the bout, with yesterday's hard clash with Russian Alexander Besputin clearly taking its toll. The Cuban began circling backwards in his own version of the moon walk, knowing he had done enough. But in the last minute of the bout, he came on hard to show how much he still had in the tank. Despaigne had a straightforward win over a tired Venezuelan which was scored 30:27 by all three judges. He will now progress to the finals to face Yeleussinov who out pointed his German rival. Domenico Valentino took on the impressive Brazilian Robson Conceicao at Lightweight. The two orthodox boxers traded leather heavily, particularly in the second round, where the defensive aspect of both boxers' games was largely rejected in favour of a rapid-fire attack orientated approach. By the end of the round, the physical effects of this effort became apparent with both boxers fading. Presumably they were enjoying themselves though as the tactics didn't change in round three after they were refreshed by a break. Though this wasn't a bout which seemed to involve a great deal of strategy, at least on the surface, they were working extremely hard nonetheless. In the final round, the Italian lost an important point for leading with his head one time too many. Tellingly, as the bell rang, Valentino walked back to his corner to be consoled while the Brazilian raised his hands aloft. The pair embraced warmly but it was indeed the Brazilian who took the bout. He now goes on to face Lazaro Estrada of Cuba in an all Latin American final. "It was a hard fight for me because the guy had a lot of experience", said Conceicao. "He was already a World Champion Milan 2009. But I was very well prepared and I would like to thank the Boxing Federation in Brazil and my team, because they helped me get this result. The bracket I had was the worst in the tournament, but despite that fact I managed to come this far, so I'm happy". Italian Domenico Valentino has medalled in every World Boxing Championships since Mianyang 2005 (Bronze) with Silver in Chicago 2007, Gold in Milan 2009 and another Bronze in Baku 2011. His third bronze at a World Championships, which he won today, means that he has collected quite the trophy haul over almost a decade of world class competition. Is the Finals! Make sure you tune in at 14:00 (Local time, Almaty Kazakhstan). The finals will be available on Youtube in most locations, or on national broadcasters.